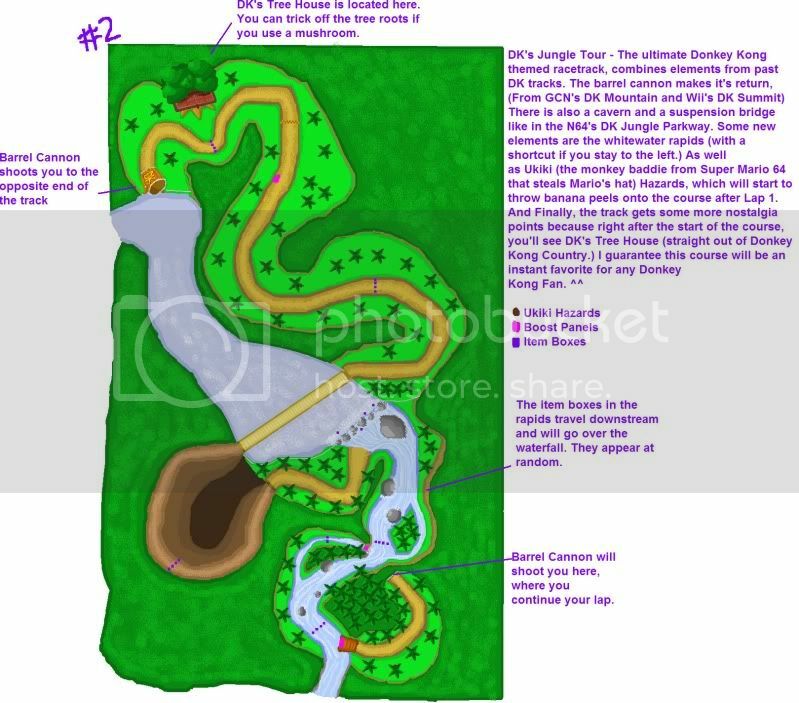 For the newer version of this custom track, see DK Jungle Tour II. DK Jungle Tour is a custom track originally designed by DemyxIX and created by HelloImYourMind. The original design can be seen here. This track was an opportunity for the author to improve his modeling skills, as well as camera editing. It takes place in a jungle that features a cave, a suspension bridge and drivable water. There are also special item boxes that will only give away Stars or Mega Mushrooms. Most of the textures are taken from N64 DK's Jungle Parkway to give the track a similar theme. DK Jungle Tour II was later made as a sequel. Changed position of the lap counter to allow shortcut through the grass. Inserted more item route points to allow Bullet Bills after the cannon. Allowed the CPUs to take shortcuts. Allowed 25% of the CPUs to get the Mega Mushroom item box in the river. Raised track by 100 units. Completely new checkpoints following the quadrilateral model to fix all position jump bugs. Added more item boxes for 2 item box rows. 2 item boxes now give a single Mushroom instead of a Star or a Mega Mushroom. This page has been accessed 43,624 times.